“Women and children first!” bellowed Captain Shrimpshire through the shrieking gale force wind and the black, dense fog. 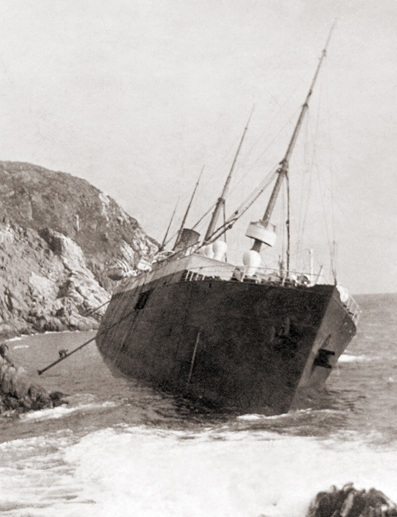 The Scotsman, the steamship he had piloted from Liverpool eleven days prior, had just crashed on the rocks of Change Island, eight miles south-east of Belle Isle, in the Dominion of Newfoundland during the early morning , September 22, 1899. These words, meant to be their salvation, sealed the terrible fate of ten women and one child. They perished. The sleeping passengers were woken at 2:30 am that Friday morning by the fog horn, which was followed by a searing crash as the ship hit the rocks. The sea was running exceptionally high. Passengers converged on the deck clad only in their night dress. The order to abandon ship was immediately given by Captain Shrimpshire, who thought that the steamship was going to topple and sink. The five lifeboats were lowered and women and children climbed aboard in an orderly fashion. The first lifeboat sank very quickly and the thirty women and one child onboard struggled for their lives in the icy water. According to one of the survivors, one of the plugs in the lifeboat was missing and the boat filled almost immediately with water. The occupants of the four other lifeboats, scantily clad and suffering from exposure to the cold, were tossed about in the unruly sea for ten hours. The Captain, fearing for their lives, called them back to the ship, which was still aground on the rocks. In the meantime, the men had climbed down to a ledge on land, and the women who had returned to the steamship were told to follow suit. Some were lowered on chairs. Now, even though on solid earth , they were in danger of the incoming tide. To survive, they had to climb a steep cliff to a plateau a few hundred feet above them. The three hundred passengers, some in bare feet, stayed on the plateau the rest of the day and night, singing hymns in the stark moonlight. Meanwhile, a small reconnaissance group had been sent out to search the nearby lighthouse for help. At daybreak on Saturday, the party returned. The long arduous journey to the lighthouse began and although it was only around fifteen miles, the way was covered in steep cliffs and swamps. By Monday, most of the passengers had arrived at the lighthouse, although some sadly succumbed to exhaustion along the way. The lighthouse keeper shared his scant provisions with the survivors. After a weekend of despair, the Elder-Dempster steamer Montfort, on its way to Montreal, was signalled to from the lighthouse. All passengers, except for about fifty, were taken on board and delivered to the port of Rimouski. While the passengers fought the elements for their very lives, ‘scabs’ who had been temporarily hired to work as stokers because of a strike in Liverpool, began looting. All the passengers’ effects were broken into and anything of any value at all, including personal letters, were taken. These men also broke into the steward’s quarters and stole all the liquor. Their ensuing lewd behavior was more than appalling. Upon their arrival in Rimouski, detectives from Montreal arrested them with the most remarkable collection of goods ever seen by them. All in all, twenty-four women died. The Scotsman was unsalvageable. Built in Belfast in 1894, the Dominion line steamship Scotsman played an important part in bringing 1286 Home Children to Canada between 1896 and 1897. According to the passenger lists, the children travelling on The Scotsman were from many different organizations: Barnardo’s, The Children’s Aid Society of London, Dr. Stephenson, Fegan Homes, the Bristol Emigration Society and the Reverend Robert Wallace are among the groups.